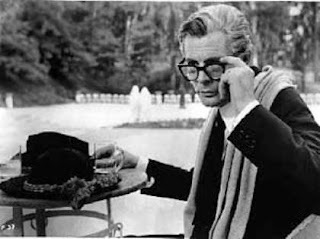 Okay, clearly I haven’t unearthed a diamond in the rough, nor am I writing about anything that any reasonably knowledgeable filmgoer doesn’t know, but Fellini’s 8½ is a great film and should be watched by everyone who wants to be a filmmaker. Made in 1963, the film is surprisingly relevant now. Italian film director Guido Anselmi (Marcello Mastroianni) is on the verge of a nervous breakdown prior to shooting his next big film. The expectations of him are high. His every word has importance, and everyone around him, from his family to his working colleagues, is clamouring for his attention. His writer and producer eagerly want his input on script and production issues, but creatively he’s broken down and has “filmmaker’s block”. As a result, Guido retreats like a turtle into his shell via his fantastical dreams and memories. Guido ventures into his subconscious to visit himself and relive his adventures as a young child. He fantasizes about a beautiful and elusive siren/goddess played by Claudia Cardinale – the perfect uncritical respite from his chaotic world. The fantasy sequences are celebrated and continue to mesmerize for their choreography and design. They are technically amazing, and at that time the film compared only with Citizen Kane for its visual inventiveness. Fellini’s use of actors and camera movement mimics the movement of the rides at a circus. Things just never stop going ‘round – people pop up in places around the frame, constantly surprising us. Of course, 8½ was named after the 8½th film Fellini had made (he co-directed Variety Lights). And so referencing his own work in the title was just one unsubtle way of informing the audience that the film is autobiographical, based on his experiences after making La Dolce Vita. The film should be seen by anyone who has questioned his or her talent in any shape or form. Almost everyone questions his or her ability to continue the upward trend of success. If the film was made today, perhaps Guido would have taken drugs to cope, and instead we would have had Fear and Loathing in Las Vegas. And who knows? Maybe Fellini dabbled in some pre-swinging ‘60s-era hallucinogens. Either way, the film is timeless.